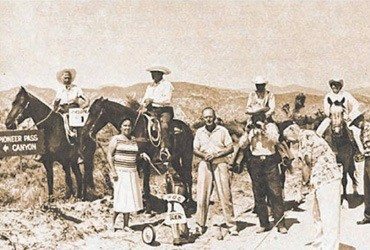 YUCCA VALLEY – The first golfer will tee off Saturday morning at 7 from the Yucca Valley Country Club to start the third annual Pioneer Pass Golf Challenge with its now Famous “19th hole” between Pioneertown and Big Bear along the historic Pioneer Pass road. 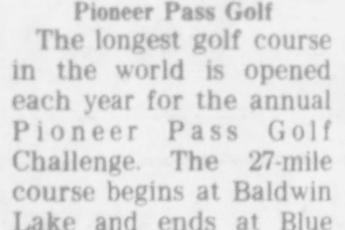 According to the Pioneer Pass Golf Challenge committee, the number of entrants in the two day event as reached 26. The limit is 30, and that number is expected to be reached before play starts. Entrants are coming from Apple Valley, Big Bear, Sunset Beach, San Bernadino, La Canada, Hermosa Beach, Redondo Beach and Hawthorne in addition to the Morongo Basin communities and the Marine Corps Base. Two of the golfers , Howard Done of Twentynine Palms, an Jimmie Hancock of San Bernadino, are playing for the third year. Five women, the largest number since the challenge started, are signed up to battle for honors in the women’s division. 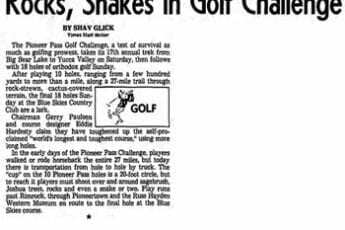 Rugged as the 19th hole is, the PPGC committee has noted that during the past two challenges only one man has given up before the finish. By 9 a.m. Saturday the first golfer is expected to have finished the nine holes at the Yucca Valley Country Club and to be ready to tackle the formidable 19th hole which starts at the end of Mane Street in Pioneertown. The Twentynine Palms Marine Corps Base will support the spotters. 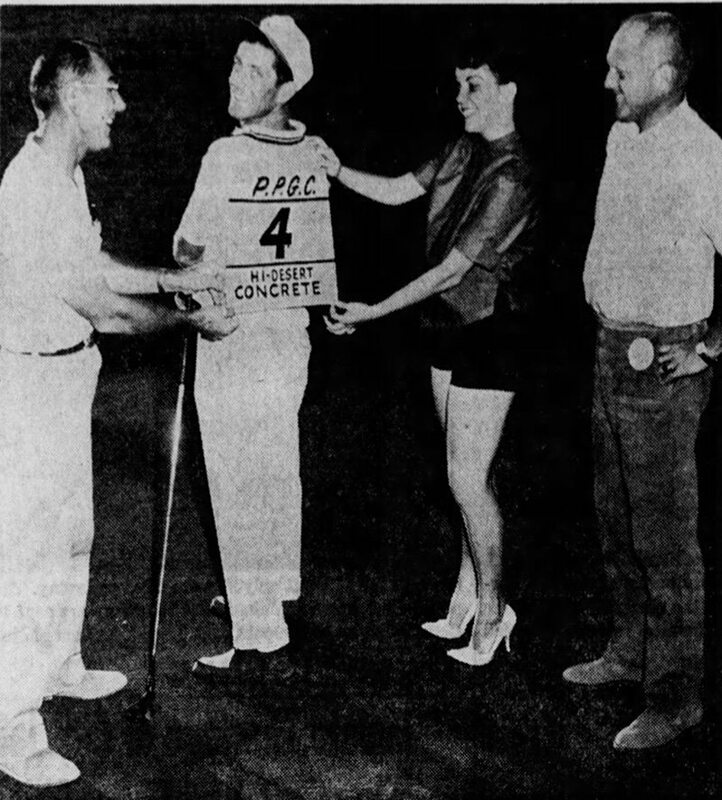 Sunday the golfers will first meet at the Yucca Valley Country Club and then proceed up the pass, across Baldwin Lake to the Peter Pan Club. Here a 19th hole buffet will be offered. The last nine holes will be played at the Moonridge Golf and Country Club. A victory dinner will begin at 6:30 at the Moonridge clubhouse. Officials of the Big Bear Valley Chamber of Commerce will extend an official welcome to the golfers. The finale of the challenge will take place at Snow Summit Lodge at 9 p.m. Awarding of trophies will be followed by singing and dancing. During the entire two-day period the SOCAL 6 Net will have units placed to follow play from the check points along the 19th hole and to transmit news and human interest to various community outlets where scores can be followed.